First, some updates on the home front — I decided to list my house for sale by owner on Zillow two weeks ago to see if I’d get any hits. I ended up selling my house after one day on the market (and somehow I even made money off of it — figure that one out). This past weekend we signed a contract to build a new home! We are SOOOO excited. We got an AMAZING deal on the house and are very excited to pick our options in the next few weeks. The house is going to be a combination of the top and bottom pics on the right. 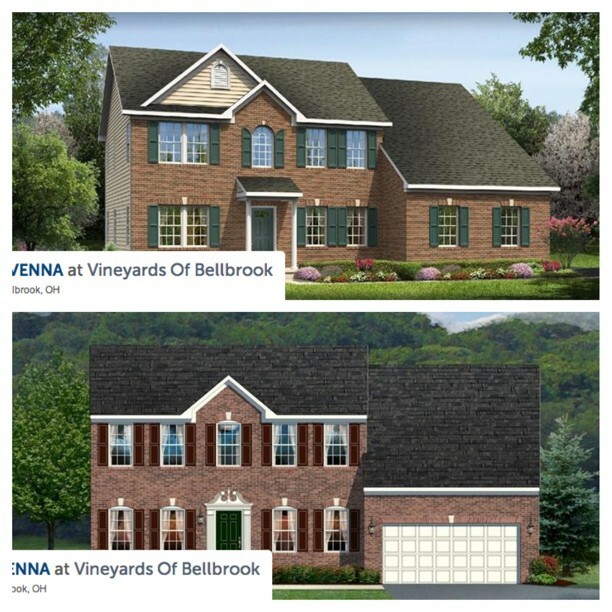 It will have a full brick front like the bottom house, but a side entry 3 car garage like the top house. I think it will turn out beautifully! 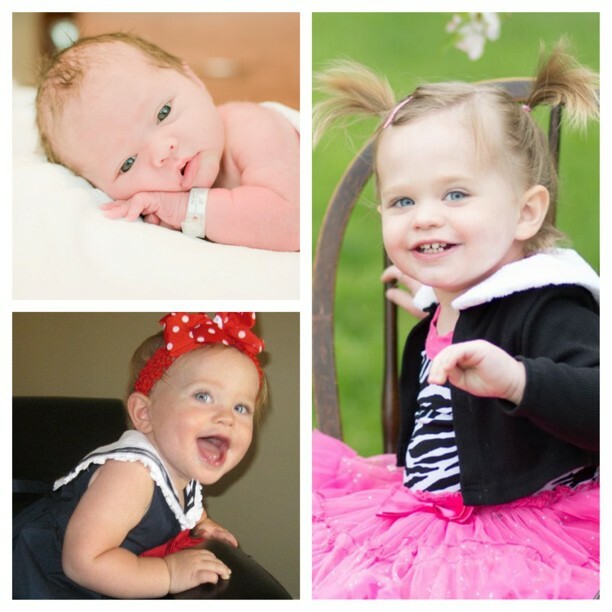 Emma’s newborn, 1 year, and 2 year photos. She turned 2 this past weekend! Emma turned two this past Sunday! It seems like just yesterday I was bringing her home from the hospital for the first time. In one sense, time has flown by, but in another sense, we have accomplished so much, and two short years has brought so many changes to my little family. In the recent months, Emma has become a VERY picky eater. She seems to do more food throwing than eating. She definitely has a sweet tooth, and I try to use that to my advantage when picking healthy snacks for her. Recently, Chobani sent us some Chobani Champion Tubes in the mail to taste-test. Emma is a HUGE fan. I actually freeze the tubes so that she can eat them more like a popsicle, and that cuts down on messes as well. Emma absolutely loves her Chobani Tubes — especially when they are frozen. 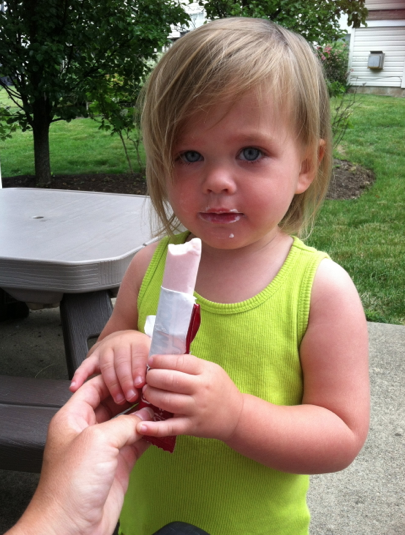 The Chobani Champion Tubes come in several flavors, and so far, Emma loves them all! Emma gets really excited about the tubes, and it makes me feel good to know that I am feeding her something healthy! Chobani has given me the opportunity to share these great snacks with you! Enter my giveaway for the Chobani Champion Tubes. Enter my giveaway for the Chobani Champion Tubes by doing one or more of the following. Comment on this post for every item you complete. I will pick a winner next Monday. Share the follow on Twitter: I’ve entered @fitparenting’s Chobani Champion Tubes Giveaway. Enter the competition here http://bit.ly/13A2jYW. I follow you on facebook! Woot! I liked and followed on Facebook! I followed Chobani Champions on Instagram. I followed Fit Pregnancy on Facebook. I followed Fit Parenting on Twitter. I followed Champions on Twitter. im following Chobani on twitter! I follow FP&P on Facebook as Tannis Wiebe. I already follow Fit Pregnancy and Parenting on Facebook! I am already following @fitparenting on Instagram, and just started following @chobanichampions on Instagram, and fit pregnancy and parenting on Facebook. I can’t wait to try these!!! I follow you on instagram. Thanks for the awesome giveaway. Following Chobani on instagram too! I’m entering. Love Greek yogurt and can’t wait to try the tubes! I now follow @fitparenting on twitter And Facebook. Yay. Can’t wait to see who gets the prize. These would also be perfect for grandmas with small appetites but need to eat good food! I follow Chobani Champions on IG. I follow Champions on Twitter. I’m following you on IG now! I’m following you on facebook now! I follow Chobani Champions on IG! I follow Champions on twitter!